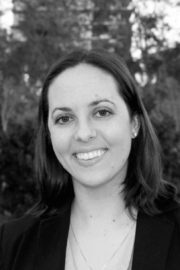 Tess Drazdowski joined OSLC as an Early Career Scientist in 2018 after completing her postdoctoral fellowship at UCLA’s Integrated Substance Use Programs in the Semel Institute and her clinical internship at the University of Miami Miller School of Medicine Mailman Child Development Center. Dr. Drazdowski holds a dual Ph.D. in clinical/developmental psychology from Virginia Commonwealth University and two masters degrees in clinical psychology. Her research and clinical work focuses on important topics for underserved and at-risk populations. Most recently, her research has focused on the misuse of prescription drugs and cannabis. She is interested in investigating how evidence-based practices can improve individuals’ substance-use outcomes via biological pathways, particularly for those with justice system involvement. Dr. Drazdowski has published peer-review articles on anxiety, substance use, juvenile delinquents, sexual and ethnic minorities, and urban adolescents. She enjoys analyzing longitudinal datasets and working with adolescents and young adults from a strength-based perspective. Dr. Drazdowski is currently accruing hours to become a licensed clinical psychologist in 2019.